A combination of classic hooded sweatshirts and jeans. Zippered, with the possibility of additional buttons. It is possible to pull the hood with strings. 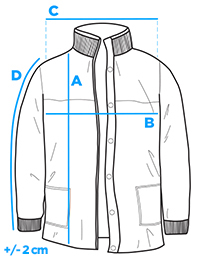 Four outside pockets - two side open ones and two fastened with snaps on the chest. Down jacket and sleeves finished with welts.